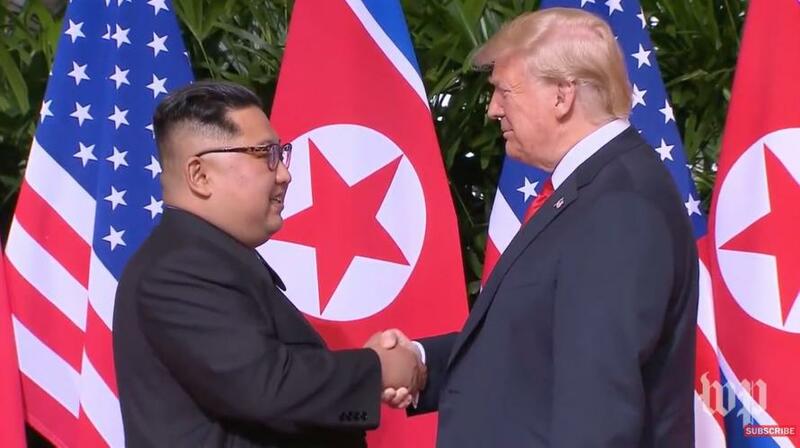 "It's my honor -- we will have a terrific relationship, I have no doubt," President Trump says as he sits down with Kim Jong Un in Singapore. "The way to get here was not easy...but we overcome all the obstacles to get here," replies Kim Jong Un. 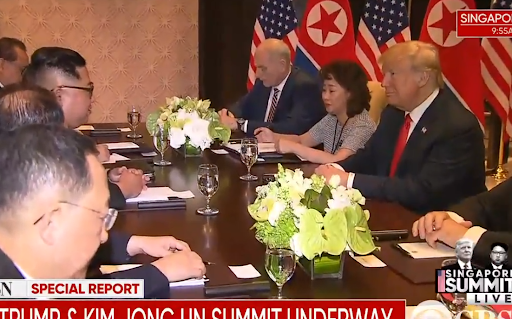 After their one-on-one talks, Pres Trump and Kim Jong-un joined their delegation members for an expanded bilateral. Once at the expanded bilateral, Trump tuned everyone out and focused laser-like on Kim. 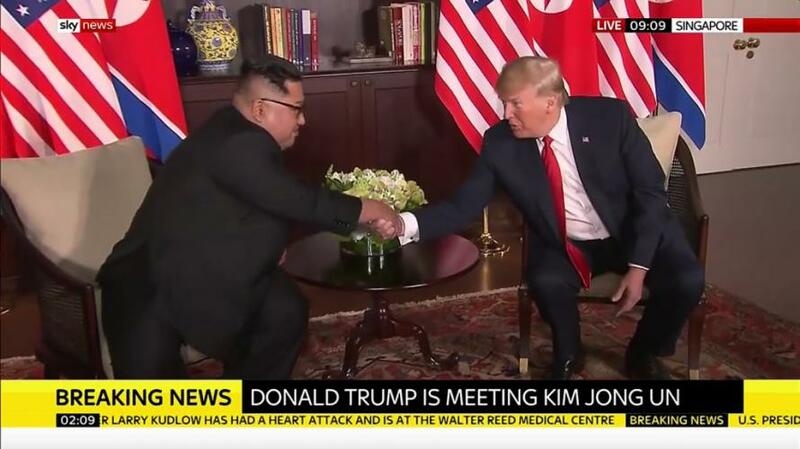 Kim: "We overcame speculation about this summit... I believe this is a good prelude for peace." Trump: "We will solve it, we will be successful... I look forward to working on it with you." 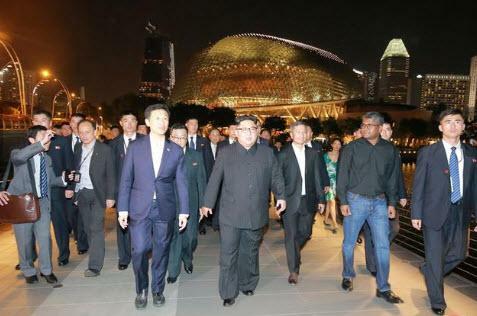 Contrary to rumors spread early Monday by the Washington Post, international media has confirmed that the denuclearization of North Korea is, in fact, on the agenda - as is the easing of US economic sanctions. 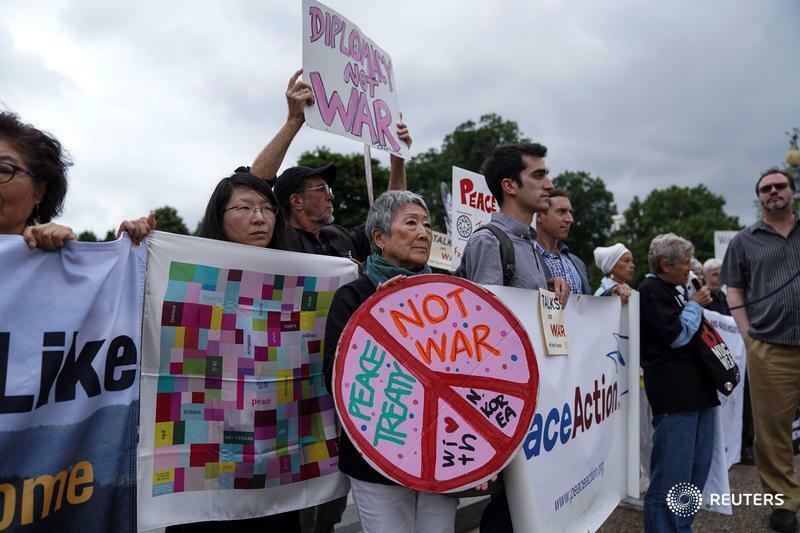 Activists hold a vigil outside the White House to celebrate the joint summit between President Donald Trump and North Korean leader Kim Jong Un held in Singapore. 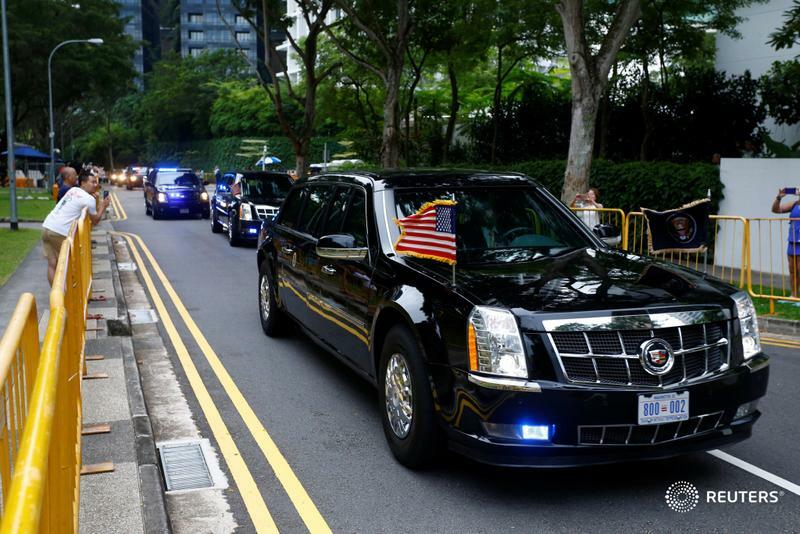 After a year of vitriolic sound, fiery tweet fury, and hidden diplomacy, the day has arrived when President Trump will meet face-to-face with North Korean leader Kim Jong Un in Singapore on Tuesday. 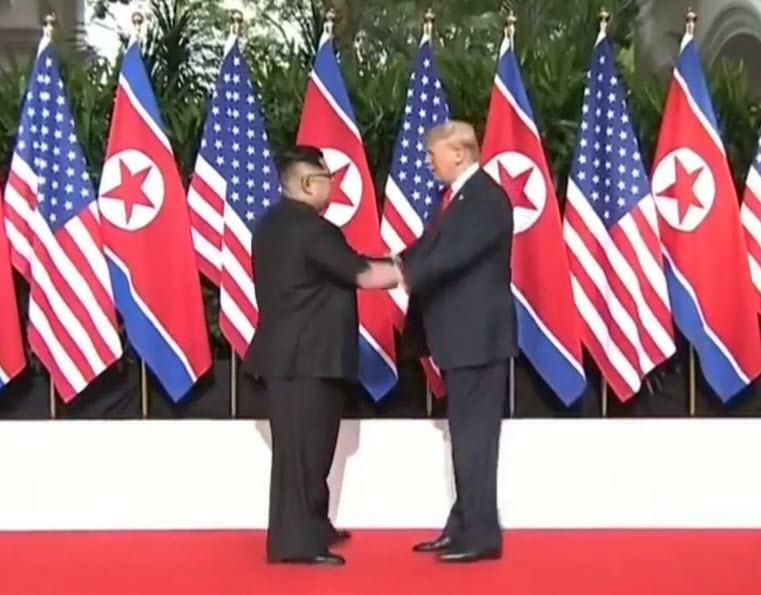 A successful summit could lead to a peace that has been elusive for 50 years; an unsuccessful summit would offer the left yet more ammunition to attack the current administration as having been 'duped' and before the summit had begun, Trump had some choice words for the naysayers... " The fact that I am having a meeting is a major loss for the U.S., say the haters & losers," Trump tweeted, then explaining where they are wrong: "We have our hostages, testing, research and all missle launches have stopped, and these pundits, who have called me wrong from the beginning, have nothing else they can say! We will be fine!" And sure enough, just an hour before the historic meeting, the House Democrats chimed in with Nancy Pelosi explaining solemnly what a "historic opportunity" this was - setting the scene for their post-summit PR blitz to play down any and every achievement - and furthermore demanding that the ever-so-helpful Congress "must weigh in on any US-North Korea deal." Democrats say they are hope Trump can pull a strong deal off, though they express worry he could accept a bad deal just to secure an agreement. As The Hill reports, The Trump-Kim meeting will be a first for a sitting U.S. president and North Korean leader, and the picture would have seemed unthinkable just a year ago. 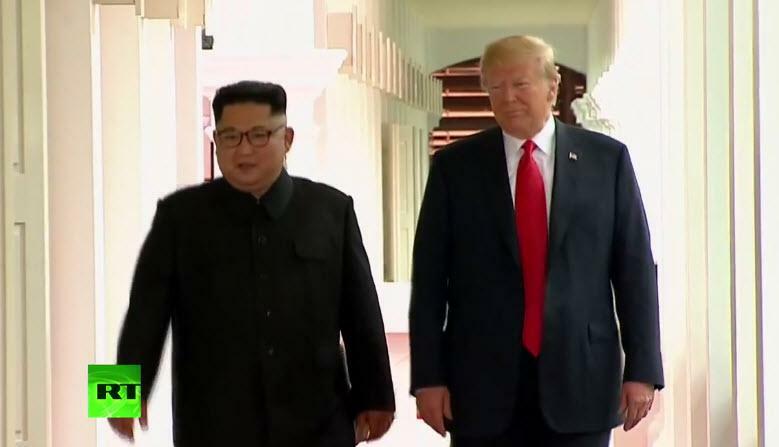 “No matter what happens, President Trump and Kim Jong Un are going to call it a success because both leaders are invested in this and they want to,” Sue Mi Terry, Korea chair at the Center for Strategic and International Studies, said at a press briefing. The history is short and often not so sweet. As The Hill details, Trump took office having been warned by President Obama that North Korea would be his gravest challenge. Tensions boiled almost immediately as Pyongyang began a barrage of missile tests during Trump’s first months in office. The tests culminated in November’s test of an intercontinental ballistic missile that North Korea said could reach the entirety of the United States. North Korea also conducting its sixth and most powerful nuclear test in September, which Pyongyang said was a successful hydrogen bomb detonation. 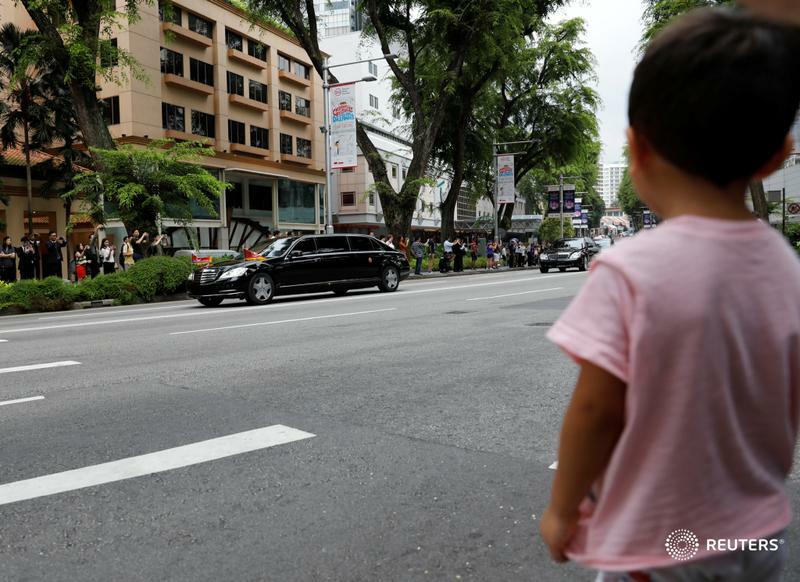 Trump responded to the provocations with provocative rhetoric, belittling Kim as “Little Rocket Man” and threatening “fire and fury.” The Trump administration also launched a “maximum pressure” campaign that sought to choke North Korea with sanctions. Then came the new year, an Olympics in South Korea and change. 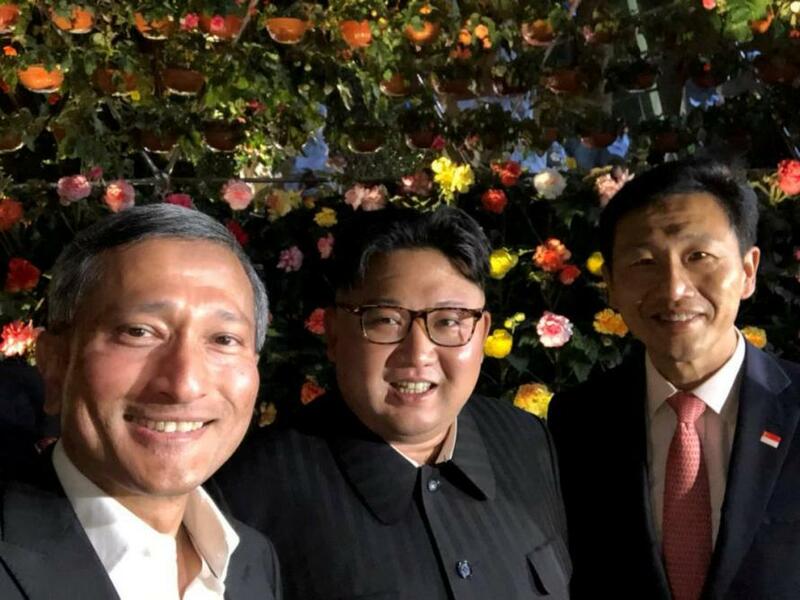 Kim used his New Year’s address to suggest a diplomatic opening: sending a delegation to the Winter Olympics in South Korea. The Olympics-inspired diplomacy led to more talks with the South, during which the North extended an invitation for Trump to meet with Kim. When the South Koreans visited Washington to relay the invitation in March, Trump accepted on the spot. Since then, U.S. and North Korean diplomats have been trying to bridge the gap between the two countries’ definition of denuclearization. Instead of “rocket man,” Trump has been calling Kim a “very honorable” man. The summit was thrown into doubt late last month after North Korea took exception to comments from national security adviser John Bolton and made clear its definition of denuclearization includes concessions from the United States. Trump canceled the meeting, but decided to move ahead with it a week later after a visit to Washington by a top North Korean official.